Parasitism is a form of one-sided symbiosis. The parasites live off the host. They may, or may not, harm the host. Parasitoids, on the other hand, usually kill their hosts. A parasitic relationship is the opposite of a mutualistic relationship. Examples of parasites in humans include tapeworms and leeches. World-wide, the most serious cause of human death by a parasite is malaria. A parasite is an organism drawing nutrients from a living host. It lives in or on another organism, getting from it part or all of its food. It usually shows some degree of adaptive modification, and causes some degree of damage to its host. 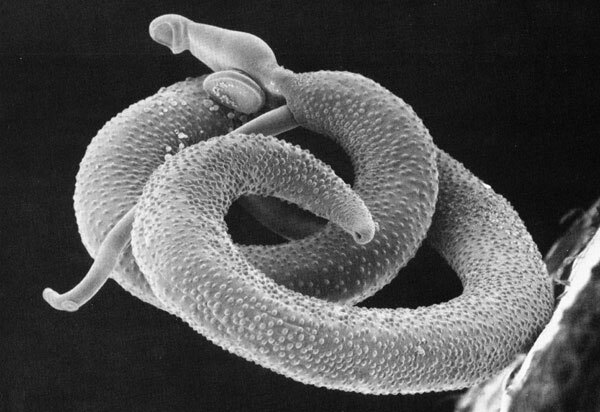 "Humans are hosts to nearly 300 species of parasitic worms and over 70 species of protozoa, some derived from our primate ancestors and some acquired from the animals we have domesticated or come in contact with during our relatively short history on Earth. Our knowledge of parasitic infections extends into antiquity". When the above definition is applied, many organisms which eat plants can be seen as parasites, because they feed largely or wholly on one individual plant. Examples would include many herbivorous insects: the Hemiptera or true bugs (leafhoppers, froghoppers, aphids, scale insects and whiteflies). The larvae of Lepidoptera usually feed and mature on a single individual of the host plant species, and what they eat accounts for most of the food for their complete life span. Moreover, caterpillars can and often do serious damage to the host's foliage. Other orders also have many parasitic herbivores: Thysanoptera (thrips), Coleoptera (beetles), Diptera (flies). Parasites of larger animals account for much research done for veterinarian and medical purposes. These parasites include viruses, bacteria, protozoa, flatworms (flukes and tapeworms), nematodes (roundworms), arthropods (crustacea, insects, mites). Parasitic wasps and flies are of great interest to the entomologist, and may be used in biological control. A huge number of species are parasitic. A survey of the feeding habits of British insects showed that about 35% were parasites on plants, and slightly more were parasites on animals. That means that nearly 71% of insects in Britain are parasitic. Since British insects are better known than those elsewhere (because of the length of time they have been studied), this means that the majority of insect species throughout the world are parasitic. Also, there are several other invertebrate phyla which are wholly or largely parasitic. Flatworms and roundworms are found in virtually every wild species of vertebrate. Protozoan parasites are also ubiquitous. Hence parasitism is almost certainly the most common feeding method on Earth. Ectoparasites live on the outside of a plant or animal. Endoparasites live inside a plant or animal. Intracellular parasites live inside cells; Intercellular parasites live in the spaces between cells. Parasitoids are organisms whose larval development takes place within another organism's body, resulting in the death of the host. There are twelve Superfamilies of wasps which are entirely or mainly parasitoid, such as the ichneumonoid wasps, whose species number over 80,000. The interaction between the parasitoid and the host is fundamentally different from true parasites and their host, and shares some characteristics with predation. A vector is a third party that carries the parasite to the host. Thus, with malaria, the mosquito is the vector, the Plasmodium protozoan is the parasite, and the mammal is the host. The mosquito is an ectoparasite as well as a vector. An epiparasite is one that feeds on another parasite. Kleptoparasites steal food from other species. Brood parasites (such as the Cuckoo) induce other species to raise their young. The Cowbird is another brood parasite. Social parasites take advantage of interactions between members of social organisms such as ants or termites. Mass production of spores or eggs. Dispersal by attaching to a larger organism (many ectoparasites). Extreme longevity of resting stages (spores or cysts). For example, plant parasitic nematodes may remain quiescent for 23 years. Parthenogenesis, and inbreeding among offspring of a single female, are common in parasites. So parasites exist in small, genetically similar groups with little flow of genes between them. In consequence, they have adaptations to solve their problems of dispersal and reproduction. Parasites face an environment which varies in time and space. Consequently, both local (geographic) races and polymorphism occur. Both may occur in the same species. Parasites are very specialised feeders: many species have only one host at any stage of their life cycle. A few use more than two host species. 1. The pathogen bacterium Rickettsia. 2. Chiggers, which are ectoparasitic mites. 3. Small mammals, especially rats. 5. Humans passing through patches where the above are present. The occurrence of all these factors together would be limited in space, and brief in time. This is typical of the ecology of parasitic infections. Both evolutionary rates and speciation rates can be high. 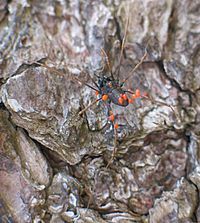 Sibling species are very common in the bug Erythroneura, in which about 150 transfers from one host to another has resulted in about 500 species in the genus. The clearest evidence comes from the large size of many parasitic families. Sometimes there is good evidence of the speed of speciation. For example, five or more species of the moth Hedylepta must have evolved within 1000 years in Hawaii, because they are specific to banana, which was only introduced then. The diversity of the hosts. How many species there are in the group being parastised, and how different they are from each other. The size of the host target: body size, population, geographical distribution. The evolutionary time available for colonisation of hosts. The selective pressure for evolutionary modification. "When a large group of hosts consisting of a wide variety of species is compared with an equivalent group consisting of few representatives, the larger group has the greater diversity of parasitic fauna". The two British oaks support some 439 species of parasite directly, and indirectly many hundred more which parasitise these parasites. "It would certainly be an underestimate to say that the two British species of oak are the primary products for a thousand species of parasite".p28 Obviously, the large size of these trees is a factor in the number of parasite species. In general, this holds whether the host is a plant or an animal. A larger bird will harbour more species of ectoparasite than a small bird. One of the reasons large trees have so many parasites is that they may have lived a long time in a particular area compared with other types of plant. They have had longer to accumulate parasites. Parasites can be most useful in sorting out the phylogenetic relationships of their hosts. Sibling host species have been discovered when their parasites diverged. Common ancestors of present-day parasites were themselves parasites of the common ancestors of present-day hosts. As the host evolves defences, so the parasite evolves to cope with this. This is co-evolution. Consider two families of host plants, the Umbellifers (fennel, cumin, parsley, hemlock) and the Gramineae (grasses). The umbellifers have many aromatic species, and are chemically diverse and pharmaceutically interesting. Their resins and oils are defences against herbivory and parasitism. On the other hand, grasses have one big defence to herbivores: their stony inclusions in their cells wear down the teeth of herbivorous mammals, but they have few chemical defences. Both families are attacked by leaf-miner flies. There are four times as many grass species as there are umbellifers, but there are twice as many leaf-miner species on the umbellifers. "This is apparently because the chemical diversity of potential hosts within the Umbelliferae has forced specialisation of the parasites. Eighty-two percent of the species of leaf-miner attack only one genus each". This is speciation which does not require geographical isolation. Ernst Mayr, the chief exponent of geographical speciation, admitted that host races of phytophagous animals "constitute the only known case indicating the possible occurrence of incipient sympatric speciation". In brood parasitism, the host raises the young of another species, here the egg of a cowbird, that has been laid in its nest. Human head lice (Pediculus humanus capitis) are ectoparasites. Schistosoma mansoni is an endoparasite that lives in human blood vessels. Parasitism Facts for Kids. Kiddle Encyclopedia.